If you're already running Chrome you should be automatically updated to the new version soon. In the meantime, here's a look at the highlights from the stable release of Google Chrome 10. When you access your browser settings by clicking on the wrench in the upper right-hand corner and selecting 'Options' ('Preferences' on a Mac), your settings will now open in a separate browser tab instead of a pop-up window. One advantage of this is that it makes it easier to navigate your settings, and not have to keep track of a floating browser window getting lost under all your other open application windows. The new settings tab also features a search box in the left navigation panel that lets you quickly find specific settings based on keywords. Let's say you were searching for browser settings that affected your browser cookies. Just type "cookies" into the search box and all corresponding settings will appear in the main section of the settings tab with your search term highlighted. One annoyance of this feature, however, is that sometimes a keyword flag will cover up parts of your settings, making it impossible to read what's underneath the flags as you can see in the above image. As you move between different settings categories (Basic, Personal and Under the Hood), the link address in the OmniBar will also change. This makes it easy for you to bookmark a specific settings category if you want to get back to it quickly in the future. If you're trying to help someone figure out their browser settings over the phone or via IM, you can also send them a link to paste into their browser instead of explaining how to navigate to the specific setting they need to change. If you're running the new version of Chrome try out the link feature by pasting "chrome://settings/advanced" into Chrome's address bar. Currently, there are only three basic links for Chrome's main settings categories of Basic, Personal, and Under the Hood. Hopefully, Google will enable greater integration in the future so that you can link to specific settings such as Privacy, Web Content or Home Page. The new version of Chrome adds password management to the browser's data sync feature that allows you to access the same Chrome settings across multiple computers. Currently, Chrome allows you to sync Web apps, autofill settings, bookmarks, extensions, passwords, preferences and themes. Google has also added a new passphrase-based data encryption feature that allows you to secure your saved passwords should your data ever get hacked. It's not clear whether Chrome's encryption feature secures just your passwords or all your synced data. Google also doesn't mention which encryption standard it uses with its sync feature, only that the company "uses a cryptographic key generated from your Google Account password." You can choose to encrypt your data using your Google Account password or special passphrase of your own choosing. You can generate an original password using apps such as LastPass or you can use an online password generator such as this one. 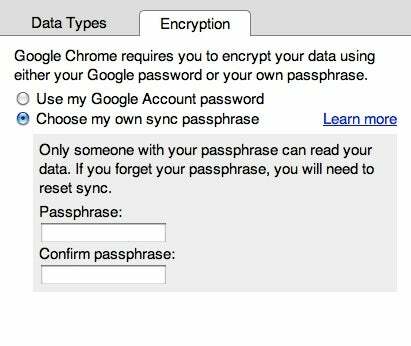 To encrypt your data go to "chrome://settings/personal" and follow the instructions under "Sync." Keep in mind that if you use a passphrase for Google Sync, you have to use that password to access your data across all PCs you've enabled with Google Sync. If you lose or forget your password, you will have to reset Sync through your Google Dashboard. This will erase all your synced data on Google's servers, but not on your desktop. So you will have to reenable Google Sync to retrieve your data across multiple computers after resetting. If you want to give Google's browser a try, you can download the latest version of Chrome here.